Q. How do I set up a multi-channel analyser in Cubase? To make the most of a multi-channel analyser plug-in, such as Schwa’s Schope, in Cubase you need to create a Quadro Group or FX track, and you can reveal each of that track’s channels as individual send-routing destinations by adding all mono ‘Child Busses’. I’d like to start using the very helpful Schwa Schope multi-analysis plug-in (www.stillwellaudio.com/plugins/schope) within Cubase Pro 9. Four different tracks can be monitored with this plug-in and, as I’m not a hero in routing, I’m finding it difficult to set this up. If I would like to assess the frequency spectrum of, for example, the kick and bass guitar tracks, how should I set up the routing? And how should I set it up if I would like to assess the effect of a compressor on the bass guitar track? Your help will be greatly appreciated! SOS Reviews Editor Matt Houghton replies: The confusion really lies in the fact that Schope is a four-channel plug-in and Cubase’s Audio tracks are not available as routing destinations from elsewhere in the project — in other words, while you can route from Audio tracks to Group or FX tracks, you cannot route from one Audio track to another. The one exception is the external side-chain input of VST3 plug-ins. Schope offers both VST2 and VST3 versions, so there are two possible approaches. One is to place the VST3 version of Schope as an insert effect on one of the tracks you wish to analyse, enable its external side-chain input, and route a post-fader send at unity gain from the second source to that side-chain input. The track on which it is inserted will be present on channels 1 and 2, the other will be present on 3 and 4. I prefer the Quadro-bus approach I used to use for side-chain compression before VST3 came along. Why? First, the VST3 evaluation version of Schope I first used to test my advice seemed a bit unstable (I don’t know if this is the case with the full, registered version), whereas the VST2 version was fine. Second, the other configuration means you can only analyse two sources — one on the same track as Schope, the other fed to Schope’s side-chain input. 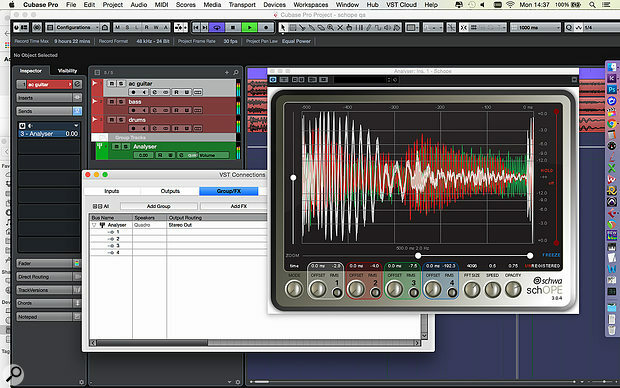 Third, I like to use a single instance of such an analyser, rather than putting one on various tracks. To do this, create a new Group track, but use the drop-down in the track setup dialogue to change the default Stereo configuration to Quadro. Insert an instance of Schope on the Group track, then go to the VST Connections window (shortcut: F4). Here, find the Group/FX tab, locate your new Group and right-click to bring up the context menu. Choose the Add All Mono Child Busses option. It’s not essential, but I recommend you rename the Group/FX track (I struggle to see any difference between these two track types other than that Groups are slightly more versatile as they can be routed to audio inputs!) to ‘Schope’, ‘Analyser’ or some such meaningful name, and then rename each of the child busses to ‘1’, ‘2’, ‘3’ and ‘4’. Now each of Schope’s four inputs should be easily identifiable and available as send destinations from any track. Go to your kick and your bass track, and set up unity-gain post-fader sends to Schope 1 and 2 respectively. You should see each represented on Schope’s GUI. You can route other sources to Schope’s tracks 3 and 4 too, though note that, presumably to avoid wasting computer resources, these are turned off by default; each channel has an on/off button beneath the RMS label. It’s also worth pointing out that each channel also has an offset parameter, which allows you to raise quieter sources in level to see which part of their spectrum may be being masked by louder sounds. If you wish to compare the same source before and after processing, the simplest approach is to route your source to a Group and perform your processing there — then route both tracks to Schope.